Chancellor Ceapoyce was interviewed in the first "Equinox Interview Telegram (EIT)", where she addresses her term as Chancellor and the future of Equinox! Summer Kickoff Pool Party -- Equinox celebrated the signing of "The Shaded Swimming Pool Treaty" alongside The Universal Allegiance in style. 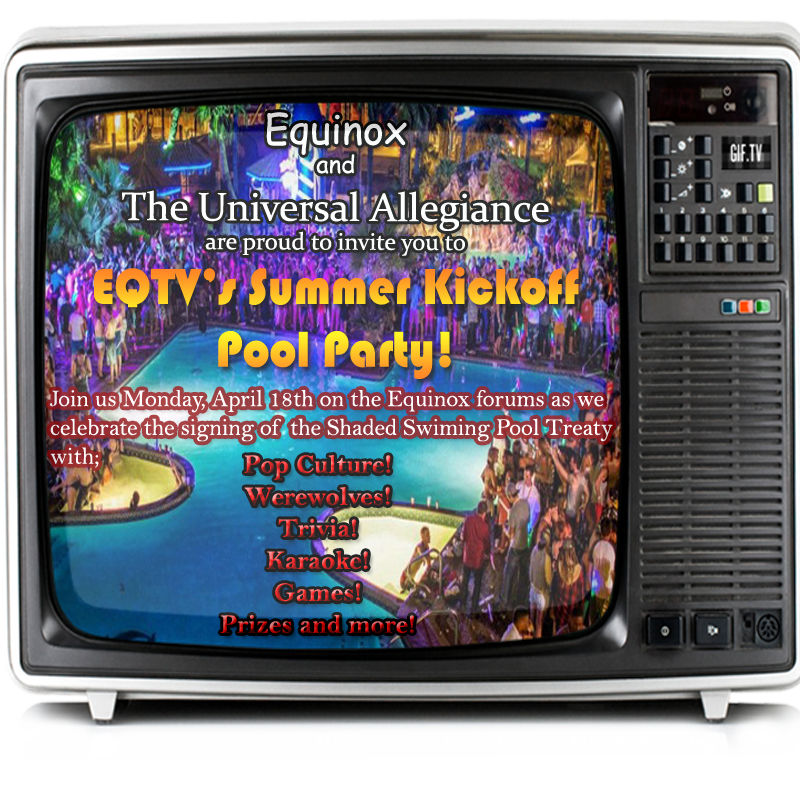 The celebration, entitled EQTV's Summer Kickoff Pool Party, boasted a myriad of games and contests! The event was very well attended by members of The Universal Allegiance as well as a few members of other regions. Participants tried to oust the Gary Busey in a game of Celebrity Werewolves, won neat prizes from random shots of liquor, sang karaoke, and enjoyed mingling by the pool. Equinox was thoroughly trounced in the regional trivia competition with The UA but managed to regain some of their lost dignity when The Hatter's Society claimed first prize in the Volleyball Tournament. The Florists, a new Guild! -- We are proud to announce we've seen the creation of yet another Guild! The Guild Confederacy of Equinox is proud to welcome The Florists! This Guild is geared toward those of our members who enjoy creative creation! Roleplay guides this Guild, and its founder, Terrabuena, has already introduced a new RP entitled "The Forest of Glim". We look forward to all the wonderful stories this Guild is sure to create! Imgur Influx, Equinox Breaks 1,000! -- During the massive influx of new nations from Imgur, Equinox reached the momentous milestone of 1,000 nations on April 29th! Current Hierarch and long time member, Asylum, noted the event with a touching speech brimming with pride. "My goals back then for Equinox were to have a semi-active board and region that is a decent size of 100-300 nations," he said, speaking of Equinox's early 2015 revival. "Instead we now sit at 1,000 nations, and that is an outstanding accomplishment in NationStates." While not all of those nations stuck around, Equinox is still going strong as a region and as a community. Asylum encouraged the region to continue to grow and prosper in his speech, saying, "Do we still have work to do? Absolutely. But I am confident in the direct that Equinox is taking, and I cannot wait and see where we are 6 months from now." Equinox's New Friends from around the World! -- Equinox is happy to announce that the following regions have opened embassies on our offsite forums; The Allied States, Grand Central, Sapientia, Lazarus, Portugal, Eientei Gensokyo, and Osiris. We look forward to continued friendly relations with all regions, and look forward to expanding our friendship with more regions! The Amendments Act was passed with a 3-0-1 Vote (For-Against-Abstain), which establishes Amendments to the Charter or passed law. Banning of Delete on Sight Players Act was passed with a 10-0-0 Vote, bans any DOS player from the Equinox forums. The Bill of Rights Act was passed with a 5-0-0 Vote, grants rights and protections to citizens, nations and players of Equinox. The Citizenship and Census Act was passed with a 4-2-0 Vote, establishes requirements for citizenry and a yearly census of citizens. The Criminal Code of the Hierarch's Court was passed with a 7-0-0 Vote, establishes sentences and lengths of punishment in the courts. Embassy Row Act was passed 5-0-1 Vote, establishes the embassy policy of Equinox. The Equinomics Act was passed 3-0-1 Vote, officially sets up Equinomics as a key function of Equinox. Foreign Recruitment Act was passed 6-0-0, bans any formal relations with regions who actively recruit from anything but the Feeders and Sinkers of NationStates. Guild Recruitment Restrictions Act was passed with a 6-1-0 Vote, limits the amount of posts a guild can advertise itself with on the NS RMB. The Holiday Act was passed with a 8-0-0 Vote, establishes Founding Day, Revival Day and Doopmas as Equinox holidays! The Militia Act was passed with a 5-2-0 Vote, grants the Hierarch or Chancellor to create a military to protect allied regions and fulfill military treaties. Remove Role Play from Government Act was passed with a 5-1-0 Vote, bans mention of any Equinox Role Plays in Government Areas. World Assembly Act was passed with a 2-1-0 Vote, establishes the Delegate elections and the Guardians. The Sentences of the Hierarch's Court was vetoed and sent back to the Conclave for edits; it eventually was signed into law as the "The Criminal Code of the Hierarch's Court". Amendment to the "Guilds of Equinox Act" was vetoed due to no compromising over key items; it has since been tabled by the proposer. Royal Solstice College Renovation -- Hierarch Asylum has taken on a personal project for Equinox by organizing the long-time standing "Royal Solstice College" which is a historical archive of all things Equinox. While it is already home to the Hall of Fame and the Telegram Vault (every single EQT, EWT, and EMT published), there will be additions such as historical regional flags, government and staff records, and possibly yearly summaries of Equinox. This is a massive project done in the background that will be completed in several months. Equinox's Statement on Osiris -- In an effort to get Equinox out on the world scale, Chancellor Ceapoyce issued a statement in regards to the Osiris situation where Cormac V Jesus Whale dominated the world news cycle. 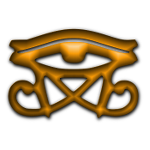 The Statement was made on the Osiris topic on the NationStates Forums. This is the first statement that Equinox issued, and it will not the be the last as we strive to make our name, and our thoughts on a world scale. Forum Staff Shakeup -- On May 19th the Forum Staff said goodbye to one of its moderators. Katalina was officially replaced as a Global Moderator on the Equinox forums, replaced with former Jr. Admin Quinncunx. We wish Katalina well and hope she returns to full activity, but welcome and congratulate Quinn back to the staff! Government Hirings & Dismissal -- On May 30th, Hierarch Asylum offered the position of Deputy of the Conclave to Lower Coleland, who quickly accepted and moved on from being a Deputy for Chancellor Ceapoyce. Chancellor Ceapoyce created the Secretary of Welcoming position and gave it to a promising new member, A Kaskadian. Since his appointment, the integration of new nations to Equinox has been quite successful with a much needed jump start to the region Mentor program. With this creation, Deputy of Government Welcoming Katalina was dismissed due to inactivity. A Kaskadian's appointment was also historical as it is the first time since 2011 that the Government of Equinox had a member from every guild in its ranks. Chancellor Ceapoyce also saw fit to create a Special Adviser role for the returning Quinncunx, to add to Ceapoyce's wealth of experience in her cabinet. Hall of Fame Addition -- Asylum had the pleasure of announcing the latest addition to the Equinox Hall of Fame. Congratulations to Silmeria on her selection, who had an amazing career in Equinox from 2009 to 2011. We wish her continued success and happiness in her retirement from NationStates. Executive Order #001; Creation of the Speaker -- Chancellor Ceapoyce issued the first Executive Order under the current Charter of Equinox on May 23rd. EO #001 establishes the offices of Speaker and Deputy Speaker, which will now run the legislative body of Equinox, the Conclave. This is a major step in giving more responsibility to the region and frees up more time for the Hierarch, who was previously running the Conclave. The changes are now going into effect, and the Speaker will be elected alongside the upcoming elections for Chancellor. Hierarch Asylum endorsed the Executive Order immediately after its issuing, voicing his own hand in making the Order and highlighting the efforts being made to grant more democratic control over the Conclave, which consists of any legal citizen of the region. Equinox's Growing Role Plays -- Your subordinate puts a big stack of folders on your desk. From all the flags on the first page you only recognize the central one, which is depicted as slightly larger than the other ones; it is of course the flag of Equinox. You look at the first page of the report. EINS News Round-Up #001: Even though things seemed to have improved since the fiasco at the Palace of Littsvin and the resulting annexation of nearby country Brasilistan by the Littsvin Armed Forces, they have taken a turn to the worse in the last few weeks, when the State Council of Kaskada declared the Sun - celestial object and center of the solar system, occasionally known under the pseudonym "Sol" - a dangerous and wanted criminal. The Scarlet Cross Assembly of the neighbouring Vyrtus did not take this declaration very well, resulting in armed conflicts on the Vyrtussian-Kaskadian border between Vyrtus and the nations encompassed by the Secret Police Alliance, notably Vneshniy Nebo, Kaskada and Lower Coleland. After threats regarding orbital mass annihilation weapons, the conflict appears to have cooled down. Hersir Wulfstan (Vyrtus) and State Secretary Peters (Kaskada) were last seen shaking hands on the salt lake between their respective nations while reports of evil laughter emanating from Kaskada's Parliament in City One have quadrupled in the last few weeks. Following the success of our comedy drama soap opera RP "As Equinox Turns", Equinoxian Secretary of RP Beo has been working on another short RP which will be introduced in the next few weeks. The current title of this new RP, which by the way will be canon in regards to our Nation RP as summarized above, is "As Equinox Burns". Expect explosions, one-liners, cliffhangers and doomsday devices. Additionally, the Equinox Role Play Rewards are now a thing! RP on our forums and earn cute little animals that are even better than the Post Reward Pokémon you could already get! Equinox Adopts Discord -- Another thing worth mentioning is our Discord Channel which has really really lifted off since its introduction earlier this year and has replaced Skype as the official way of communication outside of our Forums. We invite you to join us there as it is an excellent place to chat without the formality or quality requirement (hah!) of posting on our forums. It is also the place where we hold our Chat-RPs and we would love to have others participate. Scheduling information can be found here. A Regional Anthem in the Making? -- After round one of Equinox's search for a regional anthem has passed, the National Anthem of Aruba has been chosen as Equinox's version of the imperial march theme song. Or something. That leaves us with round two! Right now at this very moment, poetic Equinoxians are working on lyrics and trying their best to capture all of Equinox' gloriousness in a few lines of nice-sounding nonsense. If you have any ideas for a stanza or two or would like to visit our hard-working poets who are writing these lines with tears, blood and... other things, click here! --Not long ago, legendary veterans of Equinox, such as ex-King Falconias, visited the forum. It was a pleasant surprise to see vets like Falconias, Silmeria, Mekhet (M'aeq), Griff, DYP (Drop Your Pants) and Kunin return to pay the region a visit. A lovely exchange occurred between the members, old and new, where they introduced themselves, updated each other on real life as well as NS life, and generally had some fun. --With the renewal of Equinox, it was decided we needed fresh new names and new banners too! uDecide Equinox, a series of threads where multiple names for different subforums were suggested and then voted on, fulfilled this. 'BJ's Bar and Grill', which is part of 'Equinox Lifestyle and Gaming', did not get a name change. 'Completely Irrelevant, Useless & Ridiculous Happenings', the spam section, also did not get a name change. 'Lifestyle Central', home to culture, activities, and minor events became 'The Plaza of Personality'. 'Everything Gaming', the gaming forum, became 'Game On!'. The 'Arena of Role Play', AKA the roleplay section, turned into 'Illusory Lane'. Finally, The 'Citizen's Assembly', the region-wide version of the World Assembly, was renamed to 'The Conclave'. The Guild Cup Starts --To add a sense of friendly competition and rivalry between the guilds and give their members incentive to be active, the Guild Cup was created. The concept of the Guild Cup is that the staff and government award the guilds points for doing certain things (e.g. guild members posting in the spam section, discussing proposals in the Conclave, etc.) and whichever guild has the most points by the end of the term wins the Guild Cup! The Guild Cup winner receives several advantages the next term, such as receiving a tax exemption, the ability to sponsor a second PPoTW (Pointless Poll of The Week) and a cool trophy to display on their banner and in their headquarters! This term's Guild Cup winner was the Hatter's Society. Congrats, Hatters! Stay loony! We understand that this Equinox Quick Telegram, is anything but Quick. This is our first region update since March 31st, and alot has happened since then. We have already taken steps to ensure that the Equinox Quick Telegram will return to a fast read, and a more frequent one. We sure did beat you in that trivia! Nice to see you guys are very active! Thanks for the update guys! Good to see Equi going strong! Thanks for the update. Congratulations on reaching such an impressive population milestone, as well! I was about to make the quip that this was anything but quick... but you beat me to it. All in all, a good read from a great region.